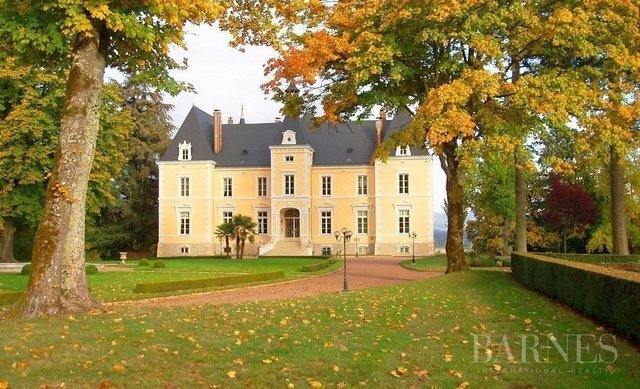 19th century castle, with outbuildings, surrounded by a park of 17 ha. A dominant location, with superb views of a protected environment. The exceptional condition of the whole is the original and rare specificity of this property. An extensive refurbishment of the castle (interior, exterior) was undertaken and completed by the current owner. Much more than a restoration, the interiors have been redesigned and transformed into vast rooms bright, functional and comfortable. The equipment is of high quality, comfort and standards of today (electricity, heating, sanitary, insulation ...). The refurbished park includes a landscaped part, a part woods and meadows. A small pond below the castle, bordered by an old chapel. Outbuildings serve as garage, workshops and other annexes. Behind these outbuildings, there is an equestrian area with carousel and box. Past an imposing entrance porch, there is a "caretaker's house". Immediate enjoyment: Complete refurbishment of high quality, as well as the setting to contemporary comfort. Calm, serenity, security: hilly and protected environment, green, exceptional view without nuisance. Space and tranquility: A large enclosed park with many outbuildings. Good accessibility: 45 minutes TGV station Le Creusot (1H30 from Paris), Saint Yan airport (71), Geneva 2H30.